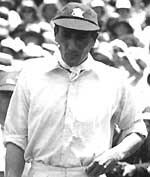 The only cricketer to represent both England and India in Test cricket, Iftikhar Ali Khan was the third Indian to play for England after Ranjitsinhji and Duleepsinhji respectively. He made his debut at Sydney during the infamous bodyline series and went on to score 102. This feat meant that all the three Indian-born batsmen who appeared in the Ashes scored a hundred on debut in the series. 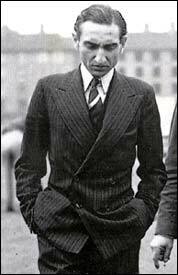 Educated at Aitchison's College, Lahore, and Balliol College, Oxford, Pataudi arrived in England at the tender age of 16. Under the astute guidance of Frank Wooley, he developed as a technically correct batsman who preferred to bide his time and wait for the loose ball. A fluent stroke player, he never backed down from a challenge. Representing Oxford university at the age of 21, he scored a massive 238 not out against Cambridge University at Lord's. His talents extended beyond the cricket field and he was part of the Indian hockey team for the 1928 Olympics. Superb performances in 1932 earned him a call-up to the England side for what was the 'Bodyline' series. He made his debut with a century but was then dropped for the third Test for apparently not agreeing with Douglas Jardine's 'Bodyline' tactics. He came back with a vengeance, scoring heavily, in the 1933 and 1934 seasons for his county, Worcestershire. He scored 224 not out, 231 not out and 222 against Kent, Essex and Somerset respectively in 1933. and then averaged 91 for the 1934 season. His performances did not go unnoticed and he earned a recall to the England side for the first Ashes Test in 1934. He, however, could score only 15 and 12 in the two innings, as Clarrie Grimmet and Bill O'Reilly ran through the England line-up, and was left out thereafter. It eventually turned out to be his last Test for England. In 1936, he left his adopted homeland and returned to India due to ill-health. 'The Nawab' then captained the Indian side when they toured England in 1946, playing in three Tests against his adopted country. But, by then, he was 36, well past his prime, having played very little competitive cricket since leaving England. His record in Test matches is not outstanding but that may have been due to limited opportunities. He averaged just under 50 for the first class games -- which gives us some measure of his class as a batsman -- scoring 981 runs on India's 1946 England tour. He died of a heart attack while playing polo. His son, Mansur Ali Khan Pataudi, followed in his footsteps and went on to captain India at the Test level. Note: He played three Tests for England and had an average of 28.80. In the three Tests for India, he averaged 11.00.